Please note- we are now shipping the Finger Clip- WITH the live on clip LCD display option (not shown here) at no extra charge! with www.theraphi.net - plasma rejuvenation. 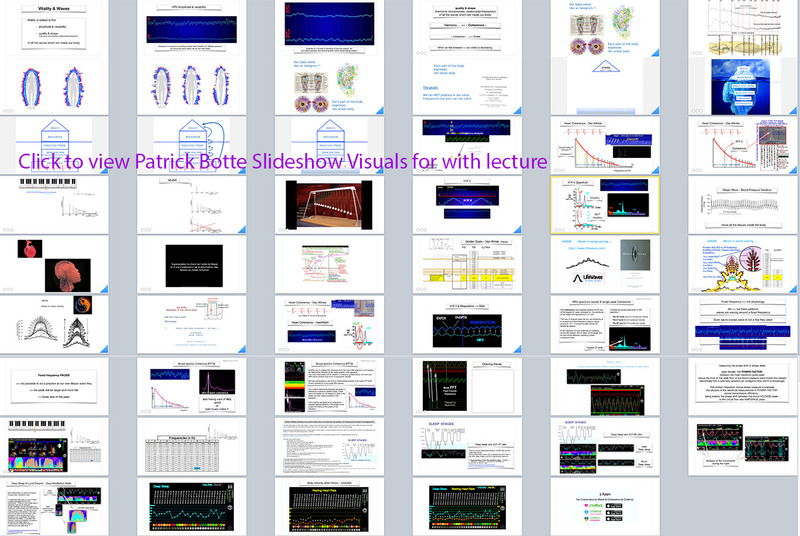 Here itHRVe biofeedback systems document the (conjugate)- Sacral-Cranial STILL POINT - healing turning point induced. -who can neither measure nor treat stress- nor teach relaxation. 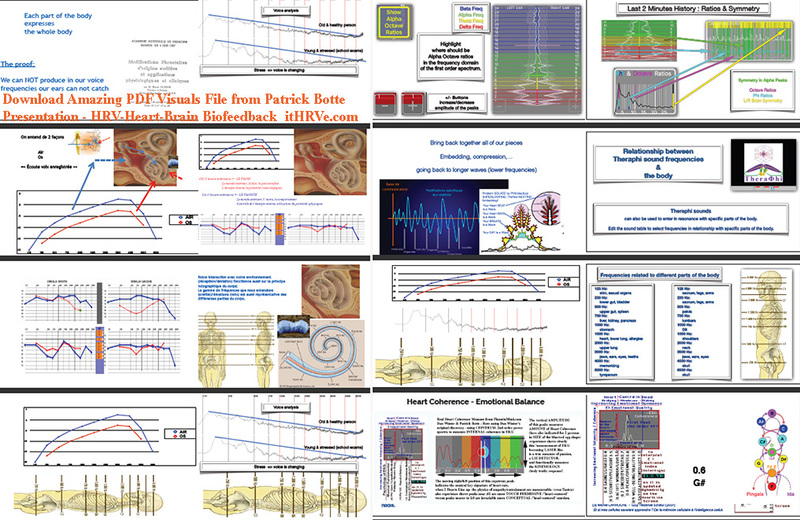 --With itHRVe - you have the latest science in the measurement of Heart Coherence. 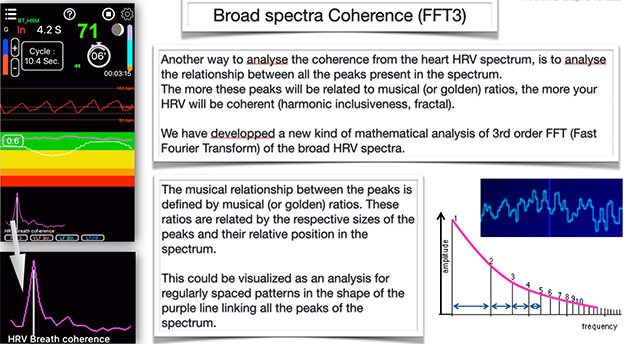 We display a simpified (and limited -see below ) - single harmonic version of heart coherence measure - ANDin addition- we display the far more sophisticated and healthy harmonic inclusive- FULL SPECTRUM COHERENCE (3rd order power spectra- see below). Below- in green and - see the third order power spectra (or FFT3) - graph of coherence in the HRV- as plotted by itHRVe. Note we plot both that graph derived directly from the HRV peak - and separately derived from the wave of blood pressure change- which itHRVe is able to separately measure and graph (see discussion also in Stress Measue with itHRVe). 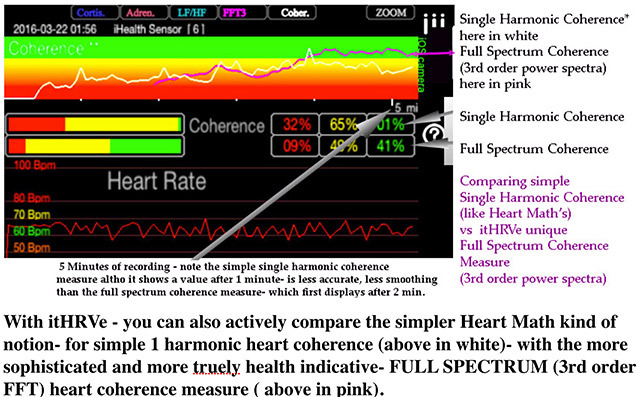 With itHRVe - you can also actively compare the simpler Heart Math kind of notion- for simple 1 harmonic heart coherence (above in white)- with the more sophisticated and more truely health indicative- FULL SPECTRUM (3rd order FFT) heart coherence measure ( above in pink). Heart coherence has almost mythic importance among students of spiritual science- and emotional biofeedback. And there is good reason for this. 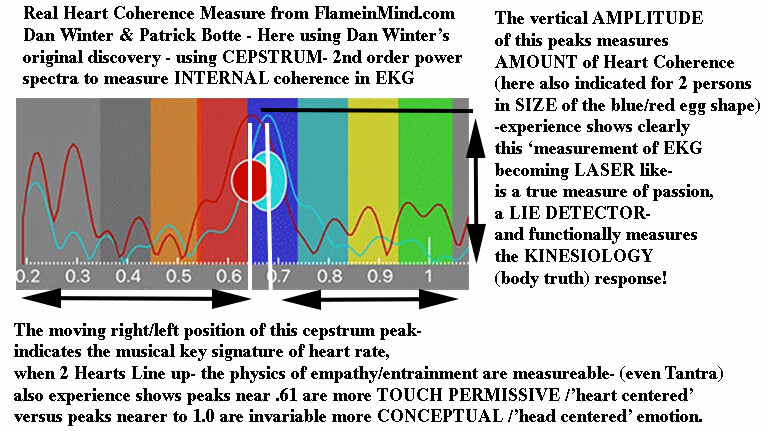 When I originally discovered how real heart coherence is meaasured- (see image- my HeartTuner) - we oftened used the Internal Cardiac Coherence peak- not just to measure the kinesiology response- but quite literally as a lie detector. 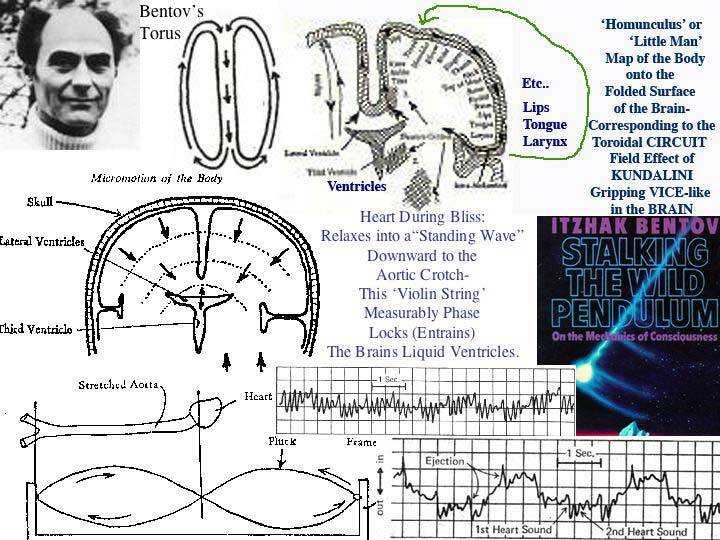 That invention was based on my original and unique discovery that Heart Coherence could best be measured by using a second order power spectra of the heart data - called the CEPSTRUM. This was my discovery for which I was credited in the literature for inventing the concept of heart coherence. That invention- my HeartTuner was later essentially stolen by an unscrupulous programmer I hired. Fortuneately- since it is now badly overpriced- and completely obsolete- there is a more powerful replacement: itHRVe.com - which is reasonably priced. Interestingly - Heart Math Institute also took from me without acknowledging my discovery of how to do power spectra of EKG to reveal emotional coherence. I spent weeks and 2 flights to California teaching Rollin McCrarty how to take his first EKG and how to take the power spectra of it . 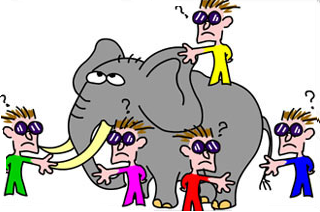 I tried to teach them to understand heart coherence- from the day they first learned to take an EKG from me, and then they first learned to take the power spectra from an EKG from me (I can prove this- their failure to acknowledge me - demonstrates their lack of integrity). - a concept later stolen by Heart Math Institute - without credit to Dan Winter. The Heart Math concept of looking for a single harmonic in the Heart HRV data to become a sine wave-- which they call coherence- can actually be an unhealthy simplification. The concept may be simply expressed - the more DIFFERENT harmonics which your heart as an oscillator contains- the more healthy you and your immune system become. The physics of what allows a maximum number of different harmonics to exist 'non-destructively' in a single oscillator- is the real deep meaning of Heart COHERENCE. 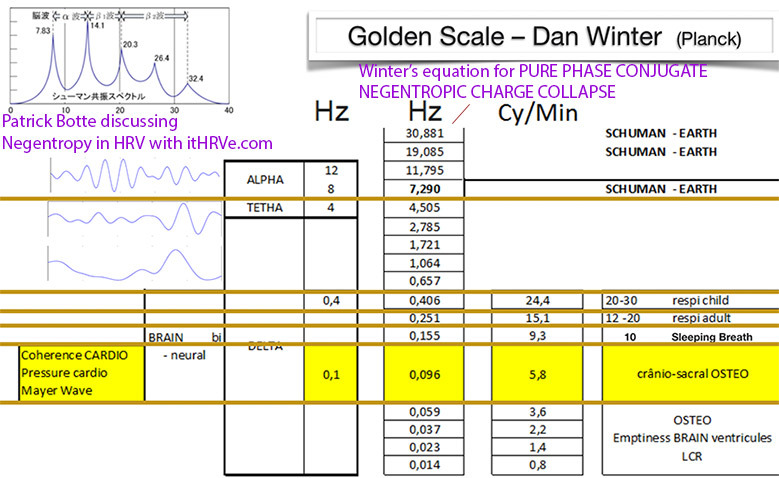 This is what using second and (in itHRVe) third order power spectra analysis do- to reveal deep coherence. They allow us to reward a harmonic rich coherent harmonic series - in your heart- as real coherence ( instead of simply one harmonic- which is rewarded- the so called 'Heart Math Mistake'). with the real history of Coherence Science..
You knew that coherence is perfected by (phase conjugating - Golden Ratio) FRACTALITY (Nodes in the hologram WORK by compression perfected). which generates the (phase conjugate dielectric) of 'DNA RADIO'. Contrast with The HeartMath "MISTAKE"
co·her·ence : The working definitions for coherence range from the tangible to the abstract, from the literal to the figurative, from the cosmic to the cosmetic. Our aim at this conference is to apply them to real-world issues facing people from all walks of life as we enter the era of Health 2.0. Bring your own brain! 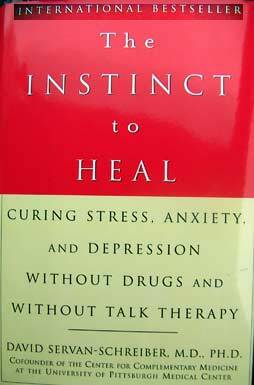 ---and speaking of coherence in the flow..
-Breakthru in Measuring INTERNAL COHERENCE. Coherence: Defining & Measuring, in the Heart and in All Oscillators. 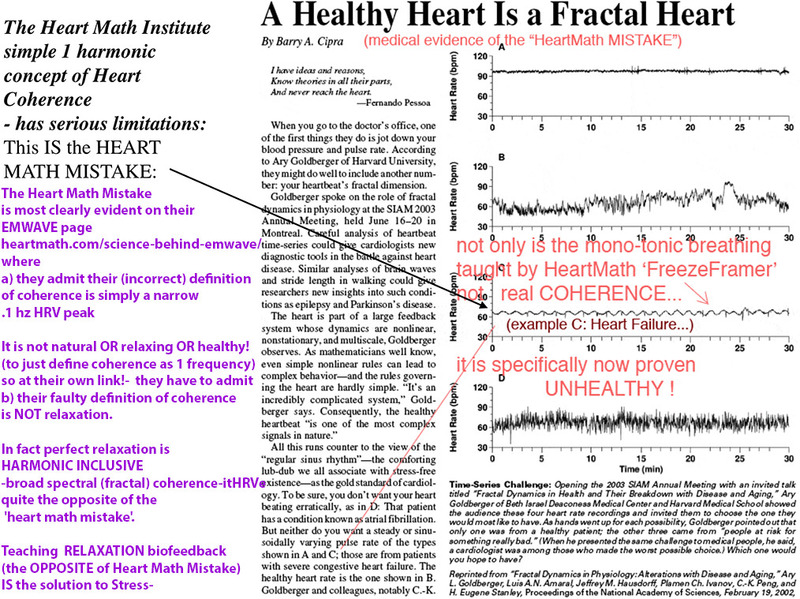 Limitations in 'Heart-Math' Institute concept of Heart Coherence? Revolution in Coherence Measurement: Emotional Coherence and Empathy Measured? 2. 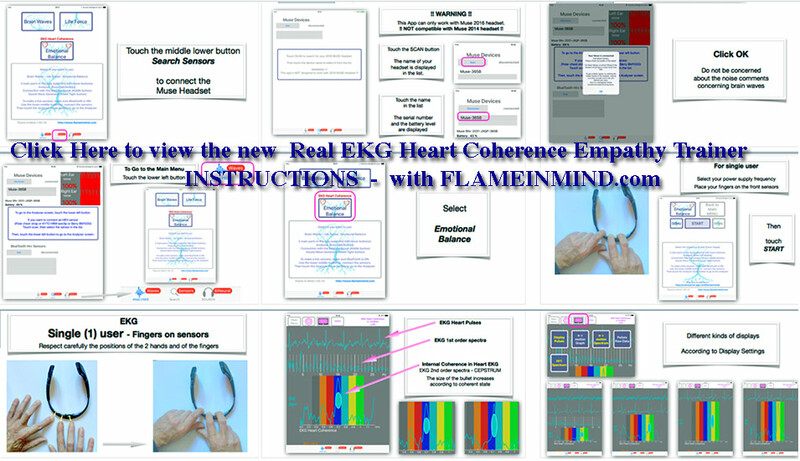 Empathy and Concensus Measurement (& Clinical Counseling)- Tantra / Marriage & Relationship Counseling / Concensus Process / Conflict Resolution - CAN 2 Hearts LINK?? 4. Ability to Measure and Teach Move from Conceptual/Head Centered to Empathic/Open HeartCentered Emotion. 5. Life Force Measurement by the same technique-may redefine VIABILITY as 'harmonic inclusiveness' using New electrical definition of life itself. Summary: I have pioneered a radically new and elegant way of measuring INTERNAL or AUTO-COHERENCE in any osicallating signal. The technique involves using a second order power spectrum / Fast Fourier Transform (FFT). The second order FFT is sometimes called a SEPTRUM (note more often spelled CEPSTRUM). This might be thought of taking a POWER SPECTRA OF a POWER SPECTRA. (This is completely different than a simple inverse FFT). We may have been the first to successfully apply the use of the SEPTRUM to dynamically analyze biological signals. The radical breakthru consists in the VISIBLY OBSERVABLE fact that the AMPLITUDE of the first or primary peak of this septrum, is a real and dynamically interactive measure of INTERNAL COHERENCE. F(t) = INT f(t-u) f*(u)du , where f(t) is original signal. This function of time is *real* even when f is complex. Double power spectrum G is square of this function: G= F(t)2 and characterizes coherence"
Note: this is a radical departure from the conventional mathematics which suggest in general coherence can only be quantified in the comparison of 2 separate oscillators. The COHERENCE within a single complex oscillator is sometimes called AUTO or INTERNAL COHERENCE. And to our knowledge has never before this invention been accurately measureable interactively. If indeed we are correct that this tool allows us to evaluate loss of internal or auto COHERENCE dynamically, the implications are profound in almost every area of physics. For example, by mesuring coherence loss in this way in DNA we would surely have a powerful tool to check on the work of genetic engineers: Letter to the UN:Genetically Modified Foods-Threaten the Physics of COHERENCE (& Ensoulment?) in DNA. Genetic engineers have been very DANGEROUSLY ignoring their responsibility to our genepol survival by ignoring the simple fact that the sustainability of DNA is undeniably it's FIELD EFFECT. Only such an INTERNAL COHERENCE measure as we propose here, can quantify this 'immortality factor' in DNA. Without this, our genepool is at risk, because the simple fatal problem of FRACTIONATION in DNA has not even before been considered by genetic engineers, simply because before this invention they had no way to measure it!. The challenge issued here is to the mathematical community. A mathematical formalism is needed that would prove the fact discovered by inspection, that internal COHERENCE can be measured by using the SEPTRUM/CEPSTRUM. Summarizing the challenge to the mathematical community: In effect does the MEASURING OF COHERENCE enable the biological teaching of wave sustainability? 2. I have found a new way to measure this coherence using the 2nd order FFT as power spectra ( sometimes called SEPTRUM, note- this is NOT an inverse FFT function). 3. 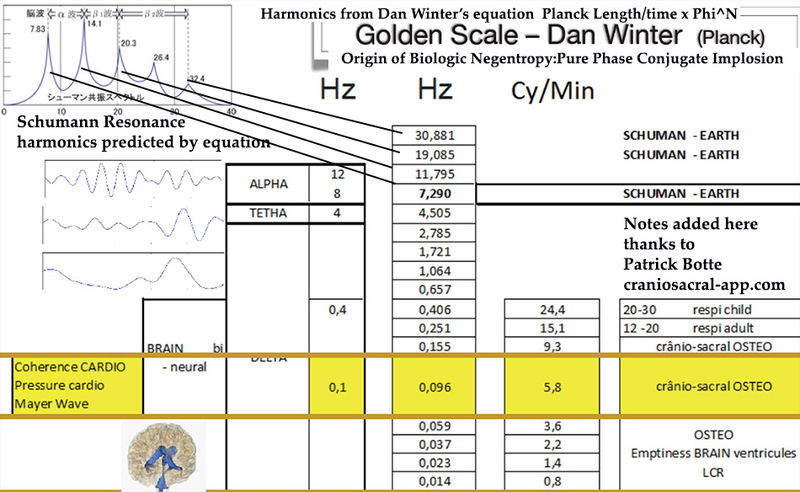 Everyone who has seen this work (sample screen below) (bottom left chart)- has agreed - FROM A SCIENTIFIC VIEWPOINT IT IS VISUALLY SELF-EVIDENT THA THE AMPLITUDE OF THAT FIRST MAJOR SEPTRUM PEAK GROWS AS THE REGULAR POWER SPECTRUM BECOMES COHERENT. It stands to reason that you use the wave shape of the power spectrum to do ANOTHER power spectrum, than you will ONLY GET A PEAK IF THE INPUT WAVES ARE ORDERED OR COHERENT. 4. So this is the challenge to the math community. All that remains, is to develop a mathematical formalism (proof of sorts) that evidences mathematically, that which is already evident by inspection. Namely : THAT THE 2nd ORDER FFT in the form of POWER SPECTRUM (or SEPTRUM), IS AN ELEGANT WAY TO MEASURE COHERENCE. 5. Suggested key words for your research : Cauchy, Coherence, Septrum, Schwartzschield Inequality..
We have been discussing the definition of COHERENCE as it applies to the HEART, for years. Stars in these conversations have been, Rollin McCraty of Heart Math Institute, and now Andrew Junker, PhD, our HeartLink engineer and builder, from CyberLink Systems. This note suggests a relationship between the poetic, the optical, the mathematical definitions of coherence. Further, it suggests our new technique of second order FFT / 'SEPTRUM' (frequency signature OF the frequency signature), as a powerful way to access, measure, quantify, feedback, and teach COHERENCE. Return to Main Article on HeartTUNER "The LoveBug"
Teaching HEAD - HEART coherence: The above SEPTRUM plot (lower left) compares the internal COHERENCE (peak AMPLITUDE) - and simulataneously PHASE ENTRAINMENT (peak X axis value / musical key ) of one persons heart (EKG in black ) with BRAIN (EEG in RED). ABOVE comparing the relative INTERNAL-COHERENCE of right vesus left hemisphere brainwaves (EEG). (To teach cross hemispheric coherence in a new more elegant way.) The lower plot is SPETRUM - second order FFT. In the HeartLink we use the 2nd order FFT or Frequency Signature as a radically new and radically elegant mathematical tool to quantify the INTERNAL coherence in ANY complex oscillator. coherent peaks of the first order fft. Supposing we were to consider the heart's distribution of voltage waves as if it were a simple light beam trying hard to become so powerful as to be worthy to be called "a laser". Then our question about measuring heart coherence becomes the same one as a laser optics physicist attempting to predict the moment at which a light beam became "coherent" enough to penentrate distances like a laser. The internal "coherence" or columnation of phases within the single beam would determine how penetrating was that beam. 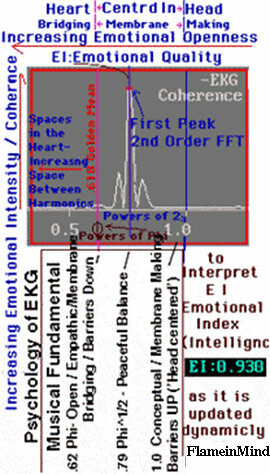 The first peak of the second order FFT clearly rises animatedly as a persons heart coherence or heart harmonics rise in the first fft. The key step in realizing the technical meaning of the word coherece, in this regard, is to understand that a SINGLE wave or parameter in a technical sense, does not HAVE coherence. "Coherence--A mathematical algorithm expressing a quantitative measure of the spatial or temporal relationships between two or more parameters. Simple coherence is the ratio of the square of the absolute magnitude of the cross spectral density function between two parameters and the product of the power spectral densities for each individual parameter. (For a generalized definition of coherence, including multiple and partial coherence, see Goodman, 1965.)" that indeed at least TWO parameters must be COMPARED to talk about coherence. So, would could not describe the ekg as a wave as having coherence IF we think of it as a single parameter. However, if we were to consider each of the sine waves arranged in the complex series we call the frequency signature or power spectra or FFT ( of the heart voltage) , THEN we could talk about the COHERENCE BETWEEN those internal harmonics. THIS is indeed what I believe this second order frequency plot (fft) does for the heartlink. Specifically, that the height or amplitude of the first peak of that plot, is a measure of whether those harmonics of the first FFT are evenly spaced (OR LITERALLY PHASE DISCIPLINED or coherent). What indeed is powerful here is that this technique of taking the second order FFT OF ANY OSCILLATOR , now can be understood as a way to quantify the INTERNAL harmonic COHERENCE OF ANY OSCILLATOR. What happens practically, is that the second FFT CHECKS to see if the space or PHASE between the harmonics of the first FFT are even or disciplined. If yes, then the amplitude of the first peak of the second FFT MEASURES THAT PHASE COHERENCE. In effect, this becomes an elegant tool to quantify and teach coherence. Albert Szent Gyeorgi showed that increased molecular ordering in cellular water prevents cancer by increasing wide distribution of triplet state electrons. (Basically cheaper phone calls between sub cellular molecules to improve TIMING coordination for meitosis the heart of cancer resistance). (his nobel prize winning work related to his book "Electronic Biology & Cancer"). showed that light scattering thru water could dependably measure whether the water had been near the body of a healer. (order increase). By using my new mathematical tool on the complex light scatter thru the water, we should clearly be able to teach that water to approach the limit condition of coherence which is the mathematical geometry of embedding perfected by phi. The Fourier transform of the logarithm of the autospectrum. Useful for determining periodicities in the autospectrum. Additions in the cepstrum domain correspond to multiplication in the frequency domain and convolution in the time domain. The cepstrum is the forward Fourier transform of a spectrum. It is thus the spectrum of a spectrum, and has certain properties that make it useful in many types of signal analysis. One of its more powerful attributes is the fact that any periodicities, or repeated patterns, in a spectrum will be sensed as one or two specific components in the cepstrum. If a spectrum contains several sets of sidebands or harmonic series, they can be confusing because of overlap. But in the cepstrum, they will be separated in a way similar to the way the spectrum separates repetitive time patterns in the waveform. Gearboxes and rolling element bearing vibrations lend themselves especially well to cepstrum analysis. The cepstrum is closely related to the auto correlation function. 2. In 1963, Bogert, Healy and Tukey published a paper with the unusual title "The Quefrency Analysis of Time Series for Echoes: Cepstrum, Pseudoautocovariance, Cross-Cepstrum, and Saphe Cracking." They observed that the logarithm of the power spectrum of a signal containing an echo has an additive periodic component due to the echo, and thus the Fourier transform of the logarithm of the power spectrum should exhibit a peak at the echo delay. They called this function the cepstrum, interchanging letters in the word spectrum because "in general, we find ourselves operating on the frequency side in ways customary on the time side and vice versa." This book describes modern Cepstrum analysis technology and its applications in speech processing. 7. Cepstrum Co., Ltd. is a developer of digital signal processing system/software in Japan. Also Cepstrum is the dealer and 3rd party developer of Hypersignal in Japan. 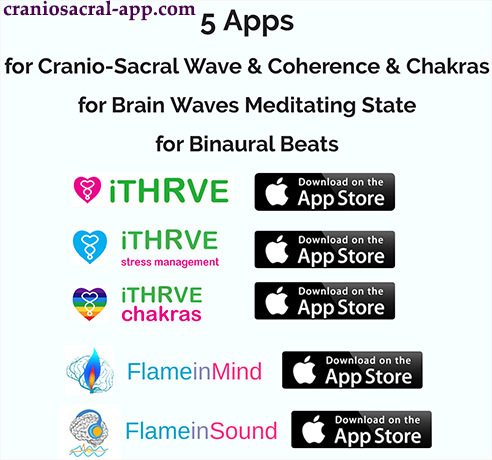 we HAVE NOW implemented/integrated BRAIN conjugation/coherence biofeedback: www.flameinmind.com <NOW Released - AMAZING EEG/ BINAURAL BEAT INTEGRATED WITH HRV! Please note- we are now shipping the Berry-Finger Clip for itHRVe.com - WITH the live on clip LCD display option at no extra charge! Note the other finger clip from iHealth- is no longer supported by itHRVe- because iHeath routed all data thru their server- which slowed the app unacceptably. 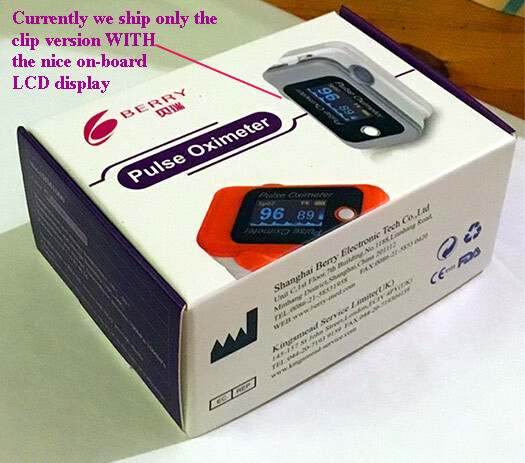 Note: if your question is which input is best for itHRVe- generally the Berry Fingerclip - because it allows you to also to measure PPG- the blood pressure wave- which gives you Sacro Cranial Pump harmonics as well ( unlike the Chest Strap - which is necessary only if you want to do overnight sleep analysis). 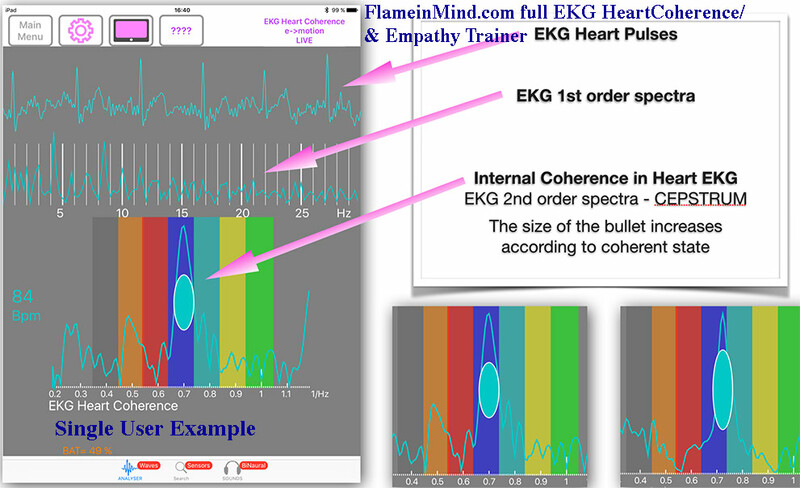 Here in FlameinMind- clear full EKG / and Heart Coherence for ONE person (top) & TWO persons (below- blue vs red) - showing EmpathyTraining ( Heart's 'ring' together when the Cepstrum /bottom graph- peaks align). - a concept later stolen by Heart Math Institute - without credit to Dan Winter. 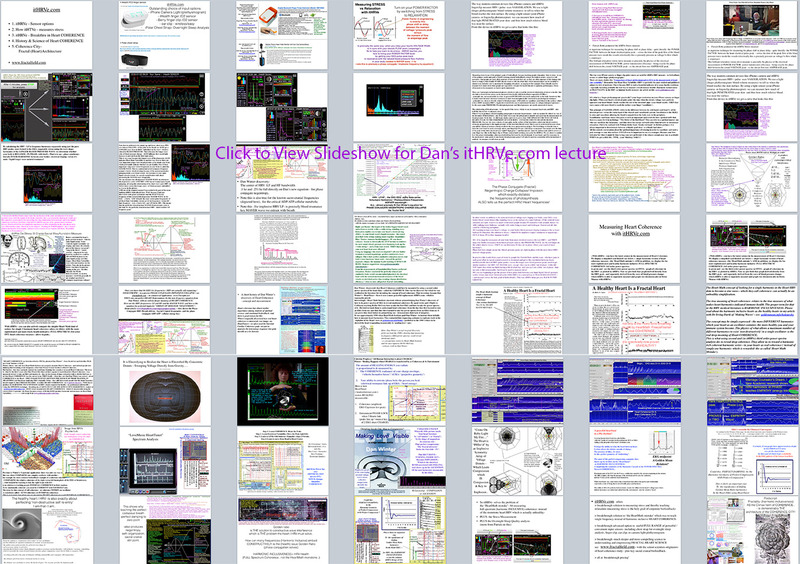 Dan Winter originally taught Rollin McCraty and Heart Math how to take their first ekg- and more important how to do this lo frequency power spectra of the ekg- especially what bandwidth to look in. It was Rollin McCraty and Heart Math who then stole this concept from Dan Winter- without crediting him. 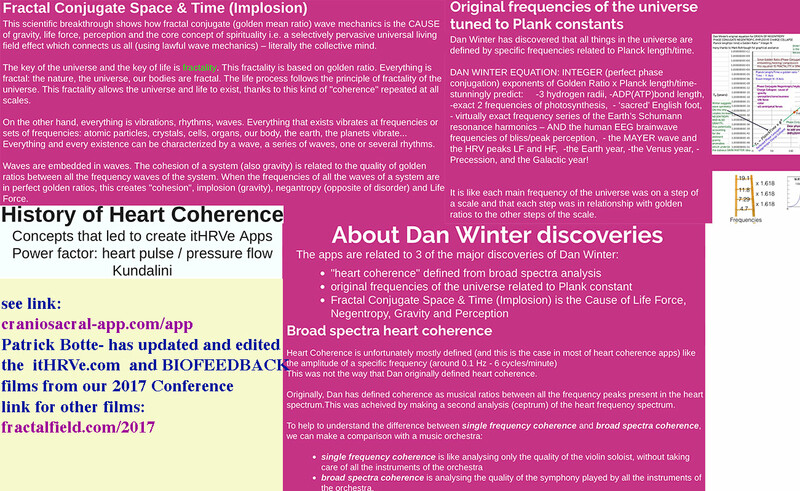 - Dan Winter- then instructed them that heart coherence was the key concept- after first denying this idea- they then tried to steal that idea also- and then - GOT IT COMPLETELY WRONG!